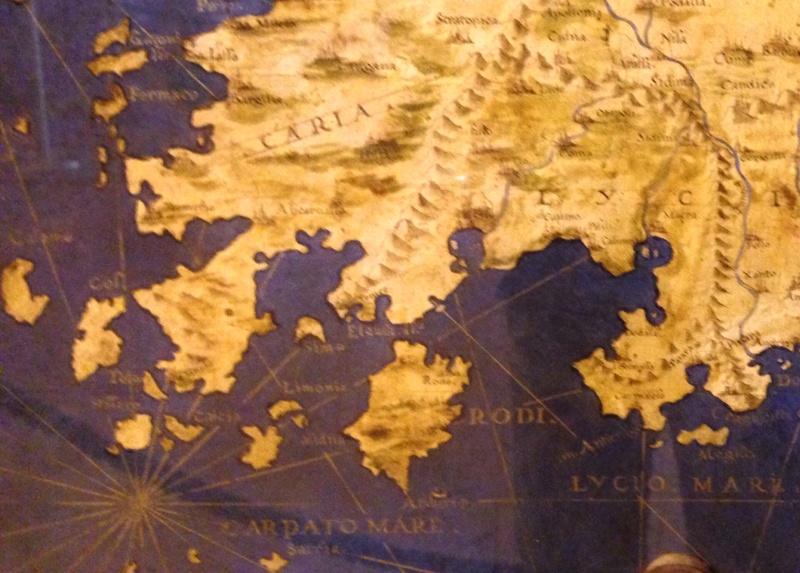 Maps should not just be cold, abstract representations of space and place. After all, they can never just be the ‘objective truth,’ because no map can perfectly convey the full scale, proportions and dimensions of the world it seeks to distill. 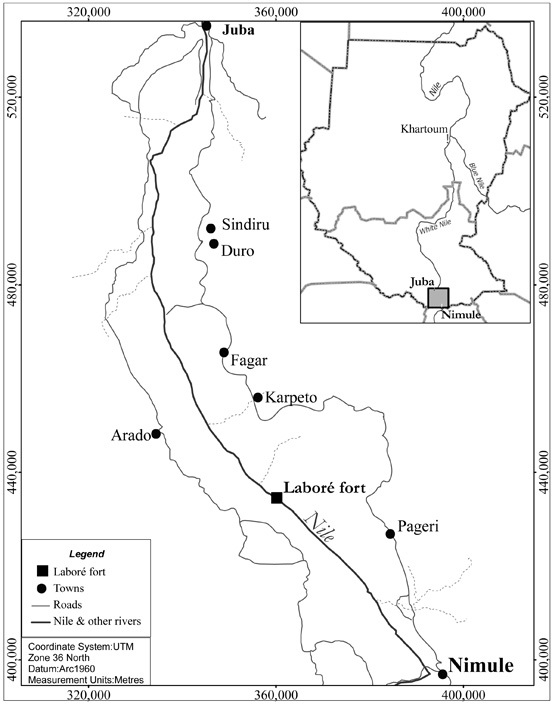 Interesting maps express passion, interest, and a personality of approach. And it never hurts if they are beautifully made. 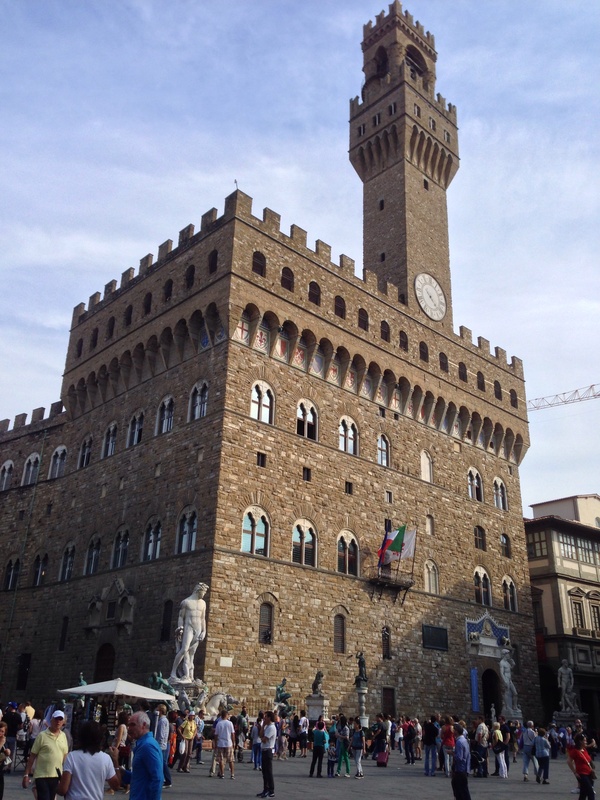 So I was wonderfully surprised, having nearly finished the tour of the Palazzo Vecchio in Florence, to encounter the Map Room, where rich lapis lazuli glows bright blue from the oil-painted seas of the world. Perugian(!) native Ignazio Danti was given the commission in 1563 by Giorgio Vasari to paint the doors of the cabinets in this Guardaroba that held the valuables of the Medicis. Danti’s aunt may have studied under Perugino (a painter we are really beginning to appreciate here; there are dozens of his works here in Perugia). Last night I took Simon and Micah to listen to a concert in the Basilica San Pietro in Perugia. 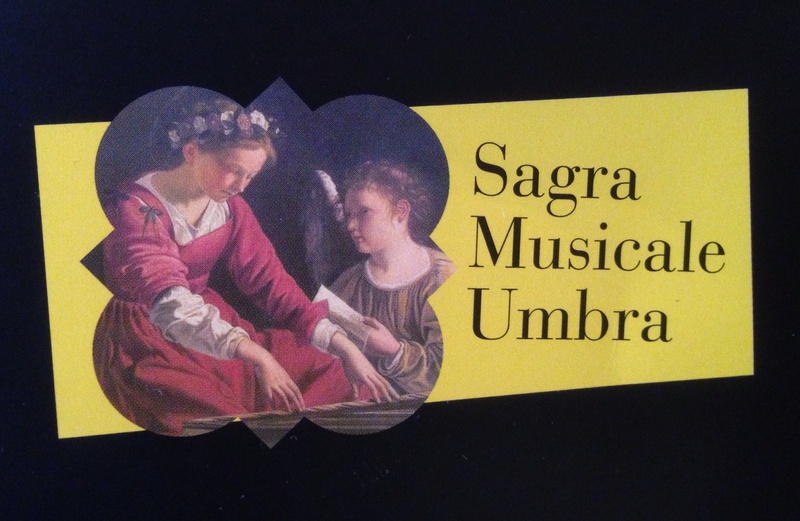 It was part of the 68th edition of the Sagra Musicale Umbra, held in cities throughout the region. The building is outside the city walls to the east and its origins go back to the seventh c. AD, so the plan of the church is based on the basilica: wide central nave and two flanking aisles. It is richly decorated throughout with carved and painted wood, frescoes, and large canvas panel paintings below the clerestory. But it was relatively dark so we could not see the art all that well, and in any case, we were there to listen to music. The program featured Franz Joseph Haydn: his Libera me, Domine, following on to Stabat Mater. The musicians were orchestral (the Accademia Hermans) and choral (Coro Canticum Novum di Solomeo), and if you continue reading, you can hear the ninth movement of their performance of Stabat Mater. 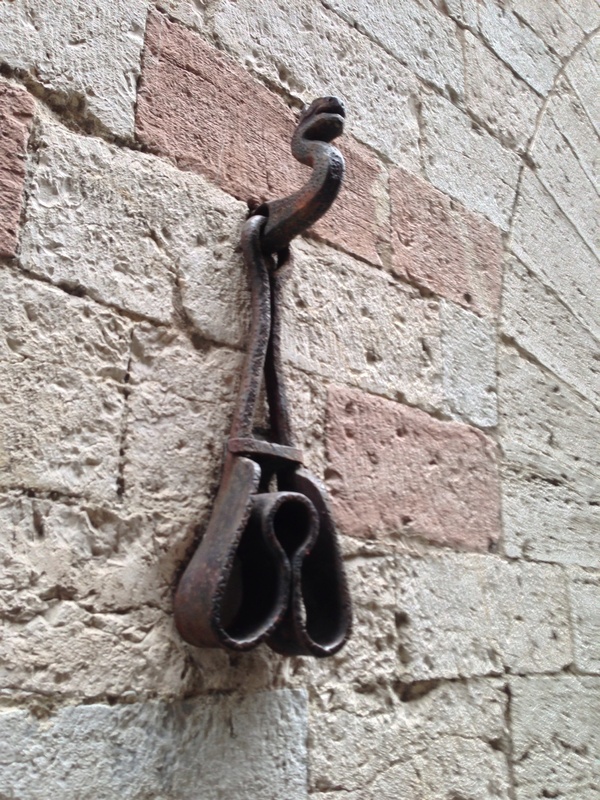 On the south and west faces of the Palazzo dei Priori in the center of Perugia, and on a few other buildings (such as an old arcade facing west onto Piazza Giacomo Matteotti), these wrought-iron objects hang from exterior walls, at varying heights from 4-7 feet. The top piece is a stylized head of a dragon (or perhaps the city-icon of a griffin); this serves as an anchor (through the transverse hole) for a broader, flatter W-shaped piece that hangs beneath. To the sides of some examples, a shallow arc has been cut away in the stone wall as if to allow for the object to swing side-to-side more easily. At some points along the wall, it is clear that the projecting anchors have been cut or have broken or rusted away, leaving just the stumps. I first noticed them in February and I’ve asked around and done some initial research, but I’ve come up with nothing. My initial hypothesis — based on no real basis except their appearance and location — was that they were shackles for public punishment (like ‘stocks’); putting wrists through the wall-side of the two pendular elements, if the hands were secured on the other side so they couldn’t slide through, would force a victim to hang there quite uncomfortably in disgrace. So of course I told the kids about the strict Perugian justice they might receive if they misbehave here. Celebrating the Jewish holidays overseas has been a mixed blessing for our family. It is hard to make meaningful connections in new surroundings and it is difficult to be away from friends and relatives. On the other hand, travel has compelled us to be creative as well as open to new traditions. When we lived in Keighley (UK), Simon and Jakob made their own menorahs out of modeling clay and we still have them. 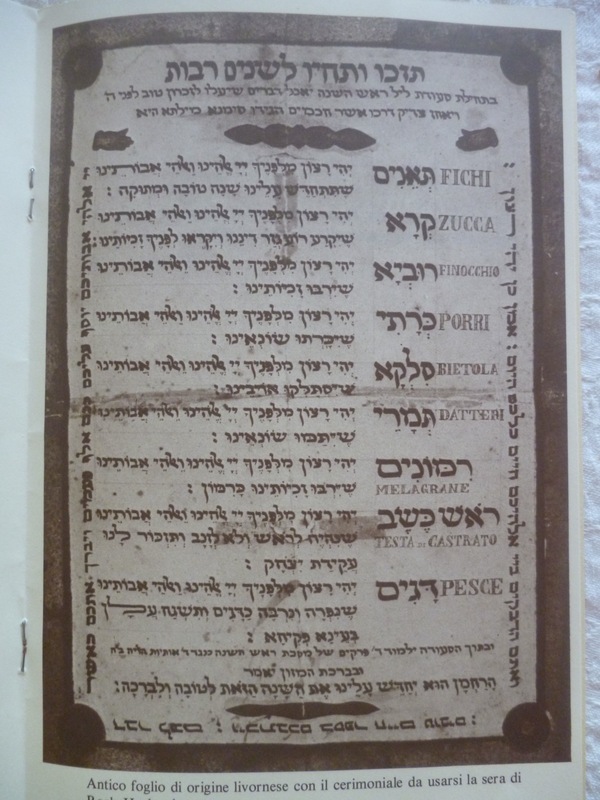 This year we experienced an Italian Jewish Seder for the New Year. We are lucky to have made an instant connection to the Jewish community in Perugia through our landlady. There is no synagogue in Perugia, it closed around 1976, so the small community gathers for lunch on the first day of Rosh HaShanah. As with most Jewish holidays, this celebration focused on the food.